We’d love your help. Let us know what’s wrong with this preview of The Paragraph Ranch by Kay Ellington. To ask other readers questions about The Paragraph Ranch, please sign up. Dee Anna Bennett has plans to attend a writer's retreat fellowship to finish writing her book about female writer G.H. Templeton as well as to spend the rest of her Summer with her daughter Abby, but her plans fall through when her 80 year old mother gets injured and must be taken care of. So Dee Anna stays behind in her home town of Claxton, Texas to care for her mother. Can she finish writing her book while staying at the Paragraph ranch? Read this book for yourself and find out. This was a pre Dee Anna Bennett has plans to attend a writer's retreat fellowship to finish writing her book about female writer G.H. Templeton as well as to spend the rest of her Summer with her daughter Abby, but her plans fall through when her 80 year old mother gets injured and must be taken care of. So Dee Anna stays behind in her home town of Claxton, Texas to care for her mother. Can she finish writing her book while staying at the Paragraph ranch? Read this book for yourself and find out. I loved this book. I found myself thinking about it while I wasn’t reading it and fascinated about Dee’s research. This is a fantastic example of a book with many focuses that was successfully pulled off without seeming scattered. The book covers Dee determining her next steps in life; her relationship with her occasionally spiteful mother, siblings and daughter; changing markets in Texas; and finding friendships in unexpected places. The book certainly has me motivated and interested to become I loved this book. I found myself thinking about it while I wasn’t reading it and fascinated about Dee’s research. This is a fantastic example of a book with many focuses that was successfully pulled off without seeming scattered. The book covers Dee determining her next steps in life; her relationship with her occasionally spiteful mother, siblings and daughter; changing markets in Texas; and finding friendships in unexpected places. The book certainly has me motivated and interested to become a writer. The folks in Dee’s writing club were strong characters with interesting views and perspectives. I would certainly read a sequel that discussed the next steps for the paragraph ranch and budding romantic interest. All in all, this was a great book that captured the beauty of the west without falling into clichés. Some times life takes you in unpredictable directions! Who should read it? Aspiring writers, wild west fans and mother/daughter duos. When Mary Alice Bennett, fiercely independent and often cantankerous widow and mother of three, suffers severe injuries in a car accident her children must decide how best to help and (hopefully) how not to hurt. They have all moved far from their tiny West Texas hometown with its agricultural roots, decamping for economic and entertainment opportunity in the city. The task falls to Dee, a professor of literature in North Carolina, to return to the farm and assist their mother in her recovery and grapple with what would be best for everyone going forward. The questions are important and painful: is Mama Bennett too elderly and infirm to continue to live by herself in her home? Should they hire help? Can they afford to hire help? Must she move to a retirement home or nursing facility? Is it time to sell the farm, the family's homestead? What responsibilities do adult children owe their aging parents? Dee must also grapple with a looming publish-or-DIE deadline that could determine the future of her career, a daughter who seems to have lost her focus on her own future, ghosts from the past that threaten to haunt the present, and a mystery: how did Mama Bennett's car end up in that ditch in the first place? The Paragraph Ranch, in its determination to be authentically Texan and its emphatic devotion to a very specific setting, will give Texans a kick out of recognizing themselves and being able to nod their heads and say, "I know exactly what they're talking about." This book effectively paints a picture of the issues confronting contemporary Texas: rural migration, legal and otherwise, to urban centers and the resulting decline of small towns, especially in the plains and West Texas; economic diversification; environmental tensions regarding oil and alternative energy sources; drought; fears held by older generations that the youngsters are going to toss tradition overboard and we will be the poorer for it; younger generations who believe, correctly, that some traditions deserve to be tossed. While reading The Paragraph Ranch, I almost felt transported to my grandmother’s house in the middle of cotton farmland in South Texas. Depictions of rural Texas are faithful to Texas farm life, from the descriptions of the town and the farm house with no air conditioning or Wi-Fi, to the strong Texas dialect engrained in its characters. Dee Anna Bennett-Kaufmann is a misplaced Texan living in North Carolina. She’d escaped farm life and Texas as soon as she was old enough to move away, and never While reading The Paragraph Ranch, I almost felt transported to my grandmother’s house in the middle of cotton farmland in South Texas. Depictions of rural Texas are faithful to Texas farm life, from the descriptions of the town and the farm house with no air conditioning or Wi-Fi, to the strong Texas dialect engrained in its characters. Dee Anna Bennett-Kaufmann is a misplaced Texan living in North Carolina. She’d escaped farm life and Texas as soon as she was old enough to move away, and never looked back. Dee has always put her career and her writing before everything else, including her family. Although she has a doctorate in Creative Writing and is an assistant professor at a renowned college, she must now finish the book she’s writing to secure her position at the college. At the worst possible time, Dee’s cantankerous elderly mother Alice breaks both wrists in a car accident, and Dee reluctantly agrees to stay with her for a few weeks of rehab. But the weeks turn into the entire summer. What both Dee and her mother learn during this tenuous time together surprises them both. Dee also agrees to facilitate a local writers’ group. She slowly realizes that its members and the narratives they create have strengthened her bond to her home town and the family she left behind. I found the writing in this novel to be very well done, and the characterizations to be very compelling. The depiction of Texas and its citizens was right on point. Even the prejudicial comments made by Alice accurately portray the old-time attitudes of Texas past, even though far from flattering to those from that era. The Paragraph Ranch is a novel about family, obligation, and the ties that bind the two together. But even more than that, it’s about what a person might discover about themselves and their loved ones if they slow down the pace; if they take the time to understand what makes each of us who we are, and to learn what strengthens the bonds between members of a family. The Paragraph Ranch was a very enjoyable book to read, and I highly recommend it. You don't have to be from Texas, or even have been to Texas, to appreciate the wit, wisdom and reality that exudes from the pages of The Paragraph Ranch. Yes, the book is set in Texas and readers from the Lone Star state will find that Ellington and Brannon capture the spirit of their beloved state, but the book is so much more than a mere exploration of place and its effects on personality. I say that, as Native Texan myself because I want this book to get its due for the masterful way the auth You don't have to be from Texas, or even have been to Texas, to appreciate the wit, wisdom and reality that exudes from the pages of The Paragraph Ranch. Yes, the book is set in Texas and readers from the Lone Star state will find that Ellington and Brannon capture the spirit of their beloved state, but the book is so much more than a mere exploration of place and its effects on personality. I say that, as Native Texan myself because I want this book to get its due for the masterful way the authors have blended genres into an intriguing narrative. The barebones story is sound throughout without the all-too often plot missteps found in much of today's literature. The authors clearly took the time to edit the work and root out any inconsistencies and awkward areas to make the readers' experience a seamless one. From page one to the end, I found myself engrossed in the story and the people that populated the pages of this novel. Having so little "down-time" from reading the book might have been bad for my sleep time, but those lost moments were not missed because the tale captured me so. There is a tremendous amount of wit and wordplay that makes the reading not only fascinating for the story, but also a pleasure for the harmonious way those words resonate in the mind. The world that has carefully been crafted by Ellington and Brannon in The Paragraph Ranch makes for fine and fun reading, but this one of those rare books that I would love to see translated to the big screen. Seeing the antics of Dee Bennett-Kaufmann come to life by a competent actress would indeed be a joy to behold. Put these authors on your reading radar because they will take your imagination on a wonderful journey of love, sorrow, discovery, that can only be described as life. I loved this book because I could relate to it on so many levels. When Dee found herself going back home to her small town to take care of her mother, I couldn’t help but compare the situation to my own life. I, too, was working on the east coast when I was forced to take care of a parent because my siblings were too busy to take it on. I enjoyed how this story unfolded and how well it was written. The authors are truly gifted in storytelling and the characters are very well developed. The dialog I loved this book because I could relate to it on so many levels. When Dee found herself going back home to her small town to take care of her mother, I couldn’t help but compare the situation to my own life. I, too, was working on the east coast when I was forced to take care of a parent because my siblings were too busy to take it on. I enjoyed how this story unfolded and how well it was written. The authors are truly gifted in storytelling and the characters are very well developed. The dialogue is spot on. Their conversations evoked so many different emotions in me—happiness, laughter, sadness, and even nostalgia. As the story developed, I loved seeing Dee’s resilience and eventually success, love and happiness. I could relate to her circumstances. A strong woman, she took her situation day by day, until finally, she felt as if she belonged. Although complicated, she handled her situation with her mother with grace. This story is inspiring. As a reader, I felt like the authors theme throughout was to never quit, that no matter what, you can find your place in the world no matter where you are. If you pay attention to the moment, you will start to appreciate this beautiful earth we live on. I would recommend this novel to all. The writing and imagery is written beautifully. I fell in love with this story and did not want it to end. The authors did a good job transporting me to the moment; I felt like I was actually on the farm with Dee, experiencing everything that she did. I was impressed at how well this book was written by two authors. They blended their styles of writing nicely. I’m looking forward to reading the next book in this series. This is an absolutely fantastic realistic fiction novel. I mean, the cover itself is gorgeous and looks like something I would pick out in a bookstore, but the story inside the book lives up to it too. Dee is a writer, who is planning to attend a writing fellowship, and her plans of doing so and spending time with her daughter Abby was thwarted when her mother was involved in a serious car accident. She found herself going back to her hometown to take care of her mother, and changing her life pl This is an absolutely fantastic realistic fiction novel. I mean, the cover itself is gorgeous and looks like something I would pick out in a bookstore, but the story inside the book lives up to it too. Dee is a writer, who is planning to attend a writing fellowship, and her plans of doing so and spending time with her daughter Abby was thwarted when her mother was involved in a serious car accident. She found herself going back to her hometown to take care of her mother, and changing her life plans completely. And even so... she ended up gaining a lot from the experience, and the readers too, as they go on this journey with her, experiences the captivating small town life and that life is honestly full of positives and surprises everywhere. Read this book with a cool glass of lemonade at your side. This book develops at a leisurely pace under the hot, dry West Texas sun. Dee returns home to care for her injured mother, and we travel with her on the journey across the sere landscapes of her farm and her heart, and watch as the rains come to revitalize both. The author never takes a cheap shot, never goes for the violent or sensational, but rather allows this very real, flawed woman to come to terms with her mother, her lover, and he Read this book with a cool glass of lemonade at your side. This book develops at a leisurely pace under the hot, dry West Texas sun. Dee returns home to care for her injured mother, and we travel with her on the journey across the sere landscapes of her farm and her heart, and watch as the rains come to revitalize both. The author never takes a cheap shot, never goes for the violent or sensational, but rather allows this very real, flawed woman to come to terms with her mother, her lover, and her daughter. She sees with unflinching eyes her repetition of the family patterns of undemonstrative, restrained, or denied affection and the withering effect this has on the growth of the child's own heart. I especially enjoyed the research and writing process of Dee's own book, and the flowering of the West Texas writers, and I was grateful for the well-crafted paragraphs, the excellent phrases and unsentimental observations. While the male characters are not fully realized, especially Max, the women fairly shimmer with life on the page. This book is ideal for book clubs as well as for readers who enjoy a beautifully written story of growing up at forty. 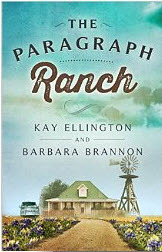 "The Paragraph Ranch" by Kay Ellington and Barbara Brannon was a bit of a crazy ride for me. The entire reading experience started poorly upon notification that I was receiving an electronic copy. Since I don't and won't do e-readers, I was forced to print a copy. For me, most of the story was predictable and simplistic, and the only real attempt to develop a character was with the central figure, Dee. 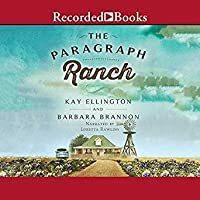 I typically wouldn't even attempt to finish something like this, but I couldn't put it down be "The Paragraph Ranch" by Kay Ellington and Barbara Brannon was a bit of a crazy ride for me. The entire reading experience started poorly upon notification that I was receiving an electronic copy. Since I don't and won't do e-readers, I was forced to print a copy. For me, most of the story was predictable and simplistic, and the only real attempt to develop a character was with the central figure, Dee. I typically wouldn't even attempt to finish something like this, but I couldn't put it down because of G.H. Templeton storyline, I was initially annoyed by the writing advice at the beginning of each chapter, but as I came to appreciate the borderline brilliant mystery surrounding Dee's research subject, I was also able to accept that device. Two authors usually makes me cringe, as their efforts are often apparent, and I wonder if that's the case in this book. Parts of it were almost literary in quality, and parts sleep inducing. In the end the Dee research angle kept me engaged and warranted a higher rating than otherwise. Dr. Dee Anna Bennett-Kaufmann has come home to her family's ranch in west Texas to help care for her ailing mother who was recently run off the road by an unidentified truck. Dee is one of three siblings, but the only one who had time to spare for their mother, who suddenly seemed a burden for everyone. It came at a time that was strained for Dee, with a summer fellowship upcoming to finish her book for her tenure at the college where she taught Literature. Enter a daughter who was having her ow Dr. Dee Anna Bennett-Kaufmann has come home to her family's ranch in west Texas to help care for her ailing mother who was recently run off the road by an unidentified truck. Dee is one of three siblings, but the only one who had time to spare for their mother, who suddenly seemed a burden for everyone. It came at a time that was strained for Dee, with a summer fellowship upcoming to finish her book for her tenure at the college where she taught Literature. Enter a daughter who was having her own crises, a non-existent boyfriend, and issues with the hired help for Dee's mother. Then there was the mystery around the subject of her book, that needed to be solved and various family members who continued to throw wrenches into the schedule. I've never read a fiction book written by two different authors, so I didn't know what to expect when I first agreed to read this book for my honest review. I admit, I was worried that I would be thrown off by two different writing styles. By the time I got to the end of the first chapter, my worries were no more. The story was captivating and an easy ready - in the best of ways. I forgot that two people wrote this - the story flowed (better than some single authored ones I've read recently I mi I've never read a fiction book written by two different authors, so I didn't know what to expect when I first agreed to read this book for my honest review. I admit, I was worried that I would be thrown off by two different writing styles. By the time I got to the end of the first chapter, my worries were no more. The story was captivating and an easy ready - in the best of ways. I forgot that two people wrote this - the story flowed (better than some single authored ones I've read recently I might add). The Paragraph Ranch is a story of family dynamics, of working through tough situations, and of personal growth. The authors did a wonderful job of developing their cast of characters. They were real and authentic. I've never been to Texas, but the women especially in this story are just as I would imagine female Texans to be. The authenticity of the characters kept me coming back for more. I didn't want to put the book down! I give this book 5 stars. Highly enjoyable. I will definitely be reading this again. Dee Bennett-Kaufmann seems to have realigned some areas in her life to focus on her writing career. All is going well until a call from Texas announcing her elderly mother was in a serious accident. Dee goes back to her Southern roots to look in on her mother. The Paragraph Ranch is a beautiful story. I am extra impressed that two authors wrote it because everything flowed so smoothly and you can see how they were both in sync with each other, their characters, and the plot. I feel that the author Dee Bennett-Kaufmann seems to have realigned some areas in her life to focus on her writing career. All is going well until a call from Texas announcing her elderly mother was in a serious accident. Dee goes back to her Southern roots to look in on her mother. Whenever I see that a book is written by two authors, I am immediately a little bit worried. Usually, it is really easy to spot which author wrote which part and it annoys the hell out of me. I don't care if it's two different characters or whatever reason they have for writing together - I want a consistent writing style. Wow, I finished this in a day and and can honestly say I was disappointed when it ended - I wanted to keep reading about the characters. This purchase was definitely out of my normal genre reads and definitely out of my element, but I thoroughly enjoyed the different feel and mood. It's been a while since I've read such interesting characters. These authors really outdid themselves and I look forward to reading more of their works in the future. Wonderful story with "real" characters that I have fallen in love with. Can't wait for the next one! I love the language in which this novel is written. The first line: “There wasn’t a soul in eleven hundred square miles of Caprock County, Texas willing or able to take care of Mary Alice Bennett, not for love or money.” Despite the expectation set, “Bless your heart” is never once uttered by a character in this 291 page work and I must admit a bit of disappointment on that count. Still, this is a tale chock full of southernisms The authors gave me a copy of this novel in exchange for my review. I love the language in which this novel is written. The first line: “There wasn’t a soul in eleven hundred square miles of Caprock County, Texas willing or able to take care of Mary Alice Bennett, not for love or money.” Despite the expectation set, “Bless your heart” is never once uttered by a character in this 291 page work and I must admit a bit of disappointment on that count. Still, this is a tale chock full of southernisms and stock southern female characters written with respect and round edges instead of cheap stereotypes. “The Paragraph Ranch” is a character driven story. We are with Dee for this experience and, in a sense, her evolution as a woman and writer. It was interesting to watch her research and writing process. At its heart, “The Paragraph Ranch” is simple and direct but without any loss of the softness appropriate to a female driven story. Dee’s flaws aren’t hidden and her awkwardness isn’t concealed. What most surprised me about “The Paragraph Ranch” is how seamlessly it’s written. Had I read other works by either author a signature style may have been evident. As a first time reader of both, I could not detect a duality of style in the work. Overall, “The Paragraph Ranch” was a delightfully warm read. I really enjoyed the relationship between characters and the awkward fun of encountering people from years before. I enjoyed how Dee was roped into the book group and her relationship with her mother, a woman not afraid to say what she thinks. There was a kinship between Dee and me in that I saw my own relationship with my mother reflected. Sometimes the point of a novel is to develop a bond with the person reading under a warm blanket with a cup of tea in hand. This novel delivers that in spades. If you like a good story, pick up “The Paragraph Ranch” today. A digital copy of this book was provided to me in exchange for an honest review. The tale revolves round Dee, who is a victim of the classic instance of Murphy's law. On the verge of taking up a fellowship which could give her all that she had been missing in life, she is forced to toss her research aside and head home, when her mom is seriously ill. Not looking forward to going back to her place for various reasons, she is least prepared for what she encounters there. This drama - romance hybri A digital copy of this book was provided to me in exchange for an honest review. This drama - romance hybrid is set in Texas. I was apprehensive about the narrative and characters - I presumed I would find myself thrown into a stereotyped Texan world, which I have found more and more rampant these days. I have felt that the stereotyped approach had ruined many nice plots. Thankfully, The Paragraph Ranch is a brilliant take on life in the region - and a very enjoyable one at that. The plot flows ever so naturally and the interaction between the characters brings a smile to the face - Dee's character specifically is endearing. Her bewilderment, perplexity and the subsequent emotional upheaval, at facing warmth and kindness in the place she least expected it, has been brought out very well. I am also thoroughly impressed that this has been authored by two people - the narrative. is so seamless and flows effortlessly. Easily one of the best dual or multi author books I've read. The only point that I wish the authors had focused on was rounding up the sharp edges of the other characters equally well. Especially since Dee's character is so well formed, it highlights the shallowness in the portrayal of the others even more. I definitely recommend this to lovers of drama and romance. This was quite a different book. I think the title is kind of cute, after having read the book. Because the best parts of this book were when the characters were in the writing classes on the ranch. There were a couple of scenes with Dr. Dee and her mom that made me laugh. Like with the rattler snake. And I enjoyed when Dee's daughter showed up. I liked her. But overall this book just seemed very average. The story line didn't have a very 'obvious' issue to overcome, other than her mom being ill This was quite a different book. I think the title is kind of cute, after having read the book. Because the best parts of this book were when the characters were in the writing classes on the ranch. There were a couple of scenes with Dr. Dee and her mom that made me laugh. Like with the rattler snake. And I enjoyed when Dee's daughter showed up. I liked her. But overall this book just seemed very average. The story line didn't have a very 'obvious' issue to overcome, other than her mom being ill and in need of help. I would have enjoyed it more if there was some conflict other than that I think. Because I mean, after a while, we get what it is like to be a caretaker of someone who is older than ourselves and should be able to fend for themselves. All in all I would say that if you like books that are very easy to read and not super hard to follow along if you need a lazy read kind of book then you might like this. I listened to it on my way to and from work in the car and it was easy to keep up even though my attention was obviously focused on the road. I did feel like part of the time the authors 'voice' shifted, it made me think there were multiple authors. At the time I had that thought I hadn't realized this book did have multiple authors. So that threw me a little because it pulled me out of the story when the 'voice' shifted. Overall 3 stars. Good book just some issues I couldn't get over. When Kay Ellington approached me about potentially reviewing this book, I debated for a few days about it. I already had so many books (and hello 2015 books- ya’ll are coming in by the truckload!) But, upon further talk with Kay (and finding out that Ivory Owl Reviews was getting a copy- I trust her!) I decided to work it in. I didn’t LOVE the cover. The cover, while nothing is technically wrong with it, made me reluctant to read the book. I could never quite put my finger on why I was not in love with the cover- it painted a visual that worked- yet, I wasn’t drawn into the cover like I am with some books. The cover did not scream “READ ME”- it more whispered of stories of lazy Texas days, some root-tooting shenanigans, and perhaps a cowboy hat or two. This book was provided to me in exchange for a review. Dee is a college professor whose career has not been as successful as she'd planned. She is very anxious to get a book published and has been granted time off to complete the project. Her publisher wants the final draft soon, and Dee is confident that he can meet the deadline. However when her mom is in an accident and needs help during her rehab, neither of her siblings are able to help. Dee is not wild about returning home, but she plans to This book was provided to me in exchange for a review. Dee is a college professor whose career has not been as successful as she'd planned. She is very anxious to get a book published and has been granted time off to complete the project. Her publisher wants the final draft soon, and Dee is confident that he can meet the deadline. However when her mom is in an accident and needs help during her rehab, neither of her siblings are able to help. Dee is not wild about returning home, but she plans to use the time to finish her book and to do her part to help the family. Her mom is a feisty character who struggles to retain her independence, though she realizes she is getting too old to manage the home place. As they work through the mystery surrounding the accident, Dee considers what 'home' means to her now that she is an adult. I enjoyed getting to know Dee's rebellious daughter, loved her cranky mother, and admired Dee for the effort she put into keeping her mom healthy and safe. While I thought the plot was a little thin, the characters make the book interesting. Is the “comfort food” of good novels. First, I received this ARC e-book from Library Thing for my enjoyment and an honest review. This was a delightful read by Ellington and Brannon, just like good comfort food to eat! The story of Dee Bennett and her decision to return to her home farm in Texas when her mother suddenly needed her, it carried the reader so nicely through all her adventures and challenges that come along with rediscovering her home town. It was the kind of old farm and small town Is the “comfort food” of good novels. Hello, I'm a native Texan and a lifelong newspaperwoman. My novels, co-written with Barbara Brannon, are valentines to West Texas, farm life, small towns, overcoming the odds, and coming to peace with the past. So, prop up your boots and enjoy the read!